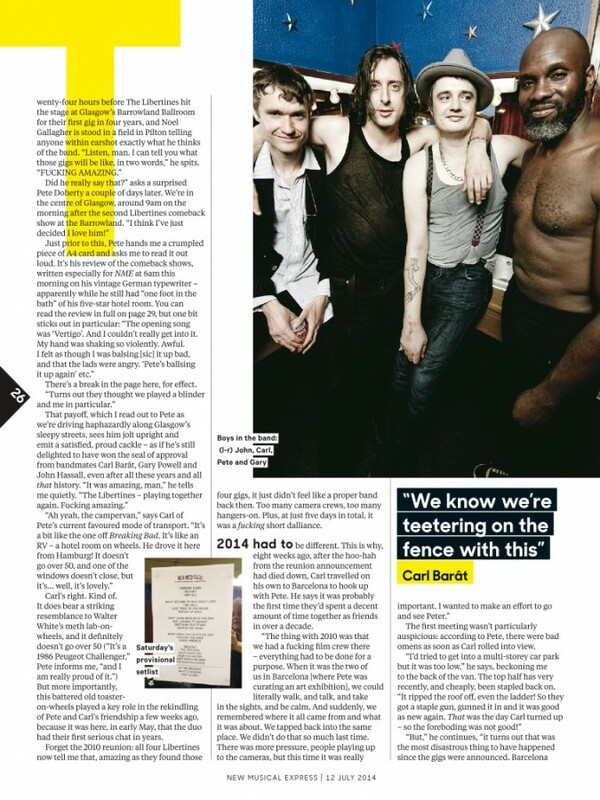 This week's NME & Shortlist - Interview & New Pictures - THE LIBERTINES! Now, after spending nearly an hour waiting in a hotel lobby for Pete (or Peter, as he now prefers to go by), a fire alarm is triggered by someone smoking in the building, which sees me venture outside with Carl Barat, John Hassall and Gary Powell – the other three-quarters of Doherty’s freshly reformed band, The Libertines. They’re waiting too, and are due on stage at Glasgow’s Barrowland Ballroom in just under 30 minutes, for their second consecutive warm-up show ahead of their money-spinning Hyde Park gig on 5 July. “Hmm, I wonder who’s responsible,” smirks bassist John, joining the dots between the fire alarm and his Awol bandmate. “Fireman Sam?” offers Libs’ drummer, Gary. Ten years has passed since The Libertines split – amid drug addictions, burglaries, spells at Her Majesty’s Pleasure and security having to stop Pete and Carl knocking each other’s teeth out. Yet some things, it seems, haven’t changed at all. Luckily, a full-scale riot is averted as the band appear on stage at an almost punctual 9.32pm. Rattling through a frantic two-hour, 25-song set, The Libertines are reborn. 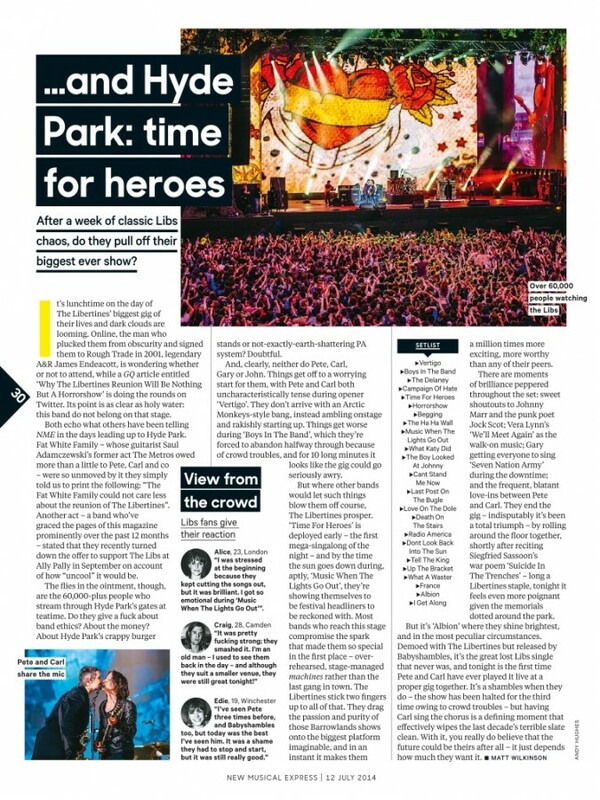 Sure, it’s rough round the edges – Time For Heroes has to be restarted and Doherty occasionally goes off-piste by jamming entirely on his own – but the young crowd, many of whom would have been in primary school when the band’s last album came out, don’t mind one bit. Crowd interaction is kept largely to a minimum – though Pete does try to reunite a fan with their lost iPhone, after first pausing for a selfie with Carl, and a bleary-eyed bald man storms the stage, almost on cue, during What A Waster. Yet all the warm, winning hallmarks of old are there, like Carl and Pete using the same microphone for their vocals and sharing a tender embrace at the end. 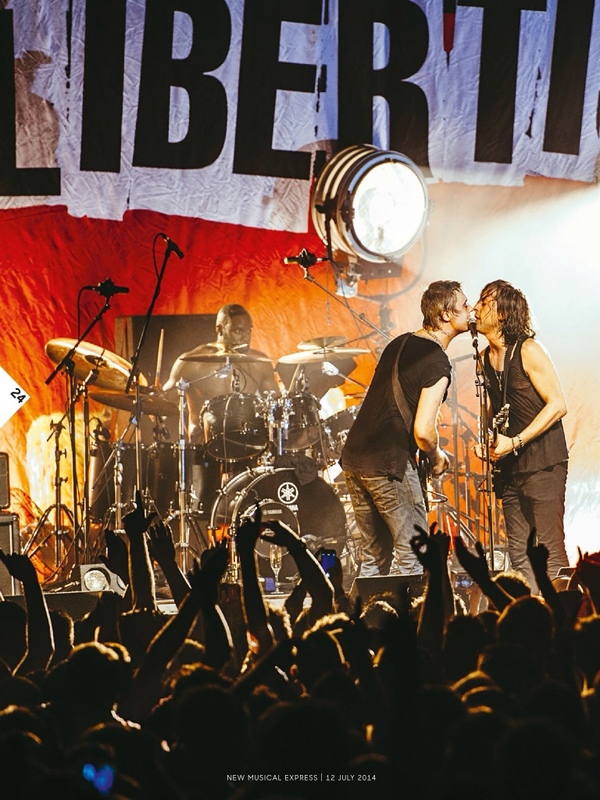 Romantic grandeur of old friends burying the hatchet aside, The Libertines copped a fair amount of abuse upon announcing their ever-expanding return. Lucrative comeback gigs are by no means a new enterprise, with everyone from The Stone Roses to Monty Python supplementing their retirement funds by getting the old gang back together. And while the Hyde Park show is rumoured to net Pete and Carl a cool £500k each, it’s not like the band’s been short of offers. Granted, sharp-minded music fans will point to a similar reunion just four years ago, but then they also turned down playing the Olympics closing ceremony in 2012. So, why now? “It just feels right, man,” explains Barat. 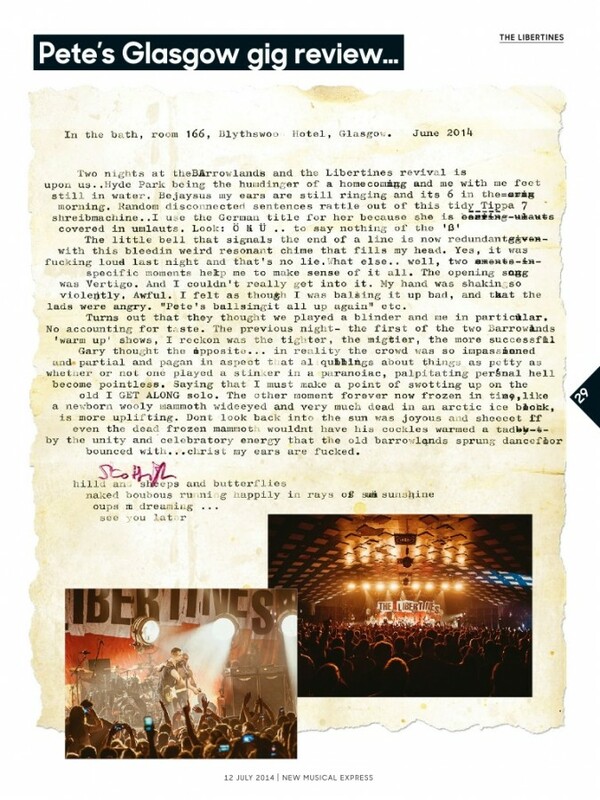 “There’s no real rhyme or reason for it – there was a Libertines-shaped hole in our lives. Cynics will question The Libs’ sincerity, but a strong hint that the four piece are reconnecting in the name of friendship came prior to this weekend, as Carl, John and Gary joined Pete at ‘Chateau Doherty’ in Germany. The original plan was to spend a few days holed up in a studio, rehearsing for the current raft of shows. And though not much in the way of practise materialised, it’s clear the trip was beneficial in healing old wounds. “It was like being kids again,” gushes Carl. “There was no one to play up for, nothing. It was just us and the music, the fields and a few bars. We were right on the outskirts in this old factory with a whole floor – bunk beds, like The Beatles in Hamburg. Since their acrimonious parting in 2004, it’s been far from a quiet decade for the Libertines alumni. As well as Carl and Pete’s respective solo offerings – Babyshambles, Dirty Pretty Things, Yeti, The April Rainers and Barat’s new Facebook-sourced band The Jackals all rose from the ashes of the band. Each member is a dad now, too, with John a practising Buddhist and Carl learning to drive just this year. No longer twentysomething scoundrels, they’re now way into their thirties and, in Gary’s case, forties. And that’s before you even mention the flecks of grey – from Gary’s beard to Pete’s dishevelled mane. You never know, it might just be this middle-aged maturity that prevents The Libertines coming apart at the seams once more. Patience is something the band will require in abundance if they really are to make Libertines 2.0 a success. With recently announced Alexandra Palace shows coming hot off the heels of an autumn European jaunt – their first taste of the tour bus since 2004 – there’s even talk of a new album. Doherty recently described this as “the dream”, but even if the band can keep it on the straight and narrow, John now lives in Denmark while Pete’s in Hamburg, leaving only Carl and Gary in London. Might this be the first Libertines album produced exclusively via Skype? Back, kerbside, in Glasgow, and there’s still no sign of Pete Doherty, a mere five minutes before showtime. Carl, Gary and John have since lost patience and bundled into a cab to the venue, leaving The Libertines renaissance dangling by a thread after just one show. But, just as it seems the Loch Ness Monster is more likely to surface than The Libertines tonight, a tired, slightly grey individual emerges from the hotel, clasping a cocktail. It’s Doherty, all right. I’m told he’s been asleep for most of the afternoon, including through the 10-minute fire alarm. Leisurely strolling towards a taxi, Pete sports matted hair, a thick neck chain and long-term girlfriend Katia on his arm. His people usher me into the back too, for what I imagine will be a drive to the venue at warp speed, or there’s every chance the band will be late. Pete doesn’t seem to be in a hurry. Some things never change. Finally granted time with the elusive musician, I ask Pete how it feels to be back gigging with his old friend Carl. “Er… I thought you just needed a lift?” comes Doherty’s reply. 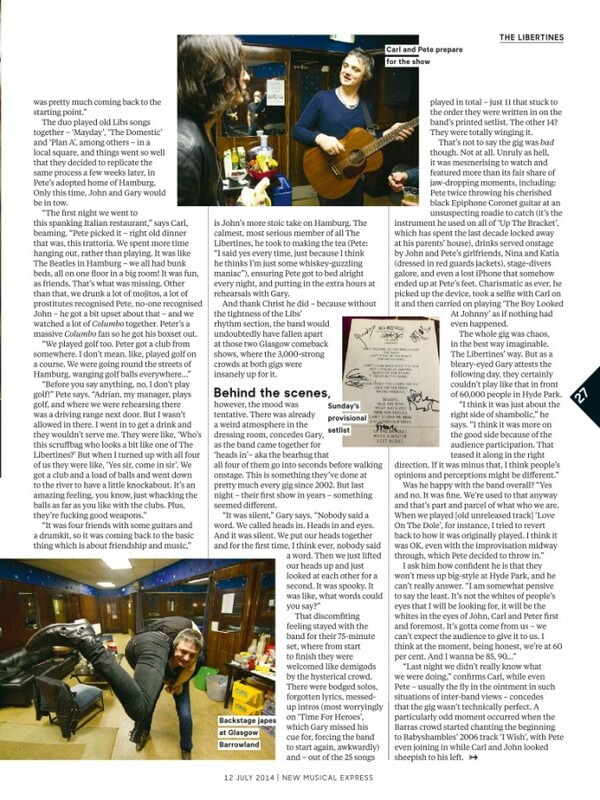 Not only is he unaware of our interview, the singer seems to think I’m an opportunistic hitchhiker. Credentials eventually assured, I quiz Pete on his and Carl’s recent city break to Barcelona, where Doherty was showcasing his artwork. Was it nice to catch up? Doherty’s soft tones scarcely register over the snarl of the taxi’s engine, as we hurtle towards the venue. Soundchecks haven’t quite gone to plan this weekend, I say, how was Barcelona for rehearsals? I spy The Libertine pub out the corner of my eye. We’re near, and it’s apparent this will be the most fleeting of meetings with Doherty. I ask him the same as Carl – you’re dads now, are you coming to this with a newfound maturity? “If you mean ‘are we all f*cking obsessed with age and extremely fretful about it’… I think Carl is,” Pete sniggers. “He’s the only one who dyes his hair. But he forgot to dye his beard, Jiggles, so he ain’t fooling anyone, know what I’m saying? If you notice, the lights are quite dark on his side of the stage. The cab rolls to a stop, outside the exceptionally unglamorous back entrance of the Barrowland Ballroom. The tour manager is awaiting Pete’s arrival by the door, as are a couple of smartphone- toting fans. As he reaches for the car door – I have just one more question: this is chaos, right? Can the band really make this work? Finger's crossed for an album next way, tho it's still a long way. Yesssss I was waiting for this! Bless you! 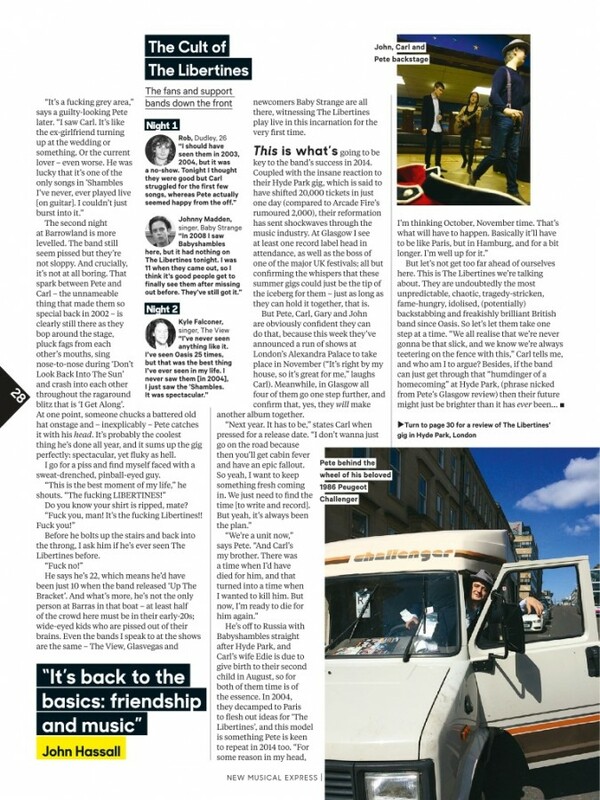 Okay someone needs to write me a story for albion_fic about what really happened in Peter's camper van (so glad NME included a picture of it) during his and Carl's first real conversation in years. Also a story about what really happened in Spain would be nice, too, since I'm here. Ayiyi. 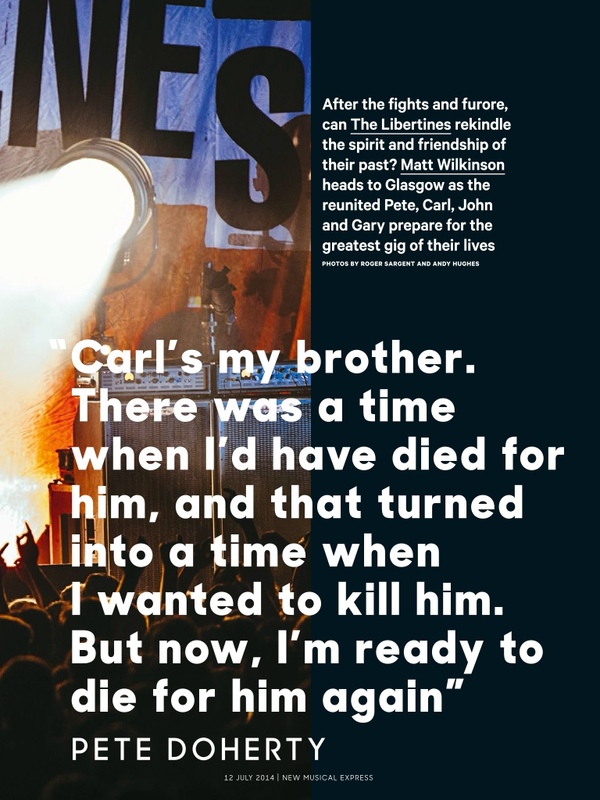 ".. Carl Barat looked in love with his old friend, going over and patting him on the back or hugging him close in between songs..."
Thanks very much for posting all the scans/interviews! Damn i am trying to get hold of the actual print issue but in germany it seems rather complicated...how old is this one? Its rwcent rite?berlins international news paper stands only seem to contain vogues of all kinds and russian fashion magazines in large quantities...grrrr its so frustrating! 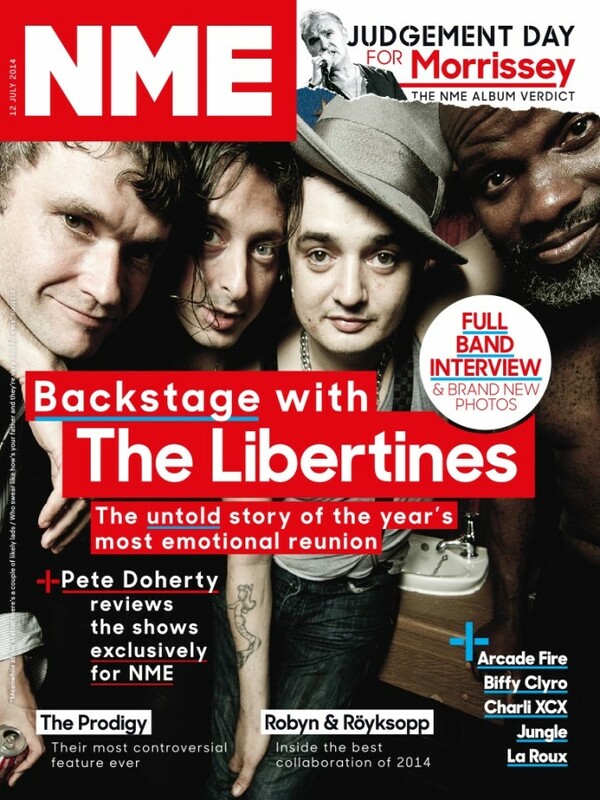 It is recent; it was released this Wednesday (9 July) and NME has a new issue every week. I know - it's really hard to track down a copy at international kiosks in Europe. Back when I still occasionally bought it whilst living in Belgium, I ended up buying it off ebay/gumtree, ordered a copy via the kiosk itself or I'd find it an English shop that sells all things UK-related. Good luck with hunting it down!